Rental Service Graphics » Airmark Co. It is important from a liability standpoint to make sure all caution and warning labels are permanent on all rental equipment. Airmark Co. designs all hazard warning labels to meet the surface and usage requirements of each piece of rental equipment. Warning labels on products keep the operator of the machinery safe, and protects the manufacturer from liability for any damage or injury stemming from use of the rental equipment. 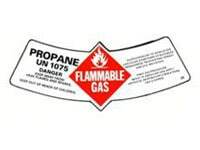 Airmark Co can design and print hazard warning labels for any item, like ladders, propane tanks, machinery and more. Just let us know the material the decal needs to adhere to, and the information necessary to have on the warning label. Leave the rest to us! Airmark provides turnkey services including design, proofing, prototyping, and manufacturing for warning labels on products and machinery.